Before talking about this amazing chicken and salad I would like to say that I am sorry for my unstable blogging the last 8-9 month. As some of you may know my husband Chris and I relocated from Denmark to Atlanta, Georgia in early April to start a new life as entrepreneurs and it has taken a lot of our time and energy. Things rarely goes as planned and we have now turned to entrepreneurial adventure B which will leave me more time for cooking and blogging, which is what I really love spending my time on. When plan B is ready to be know by the public, I will definitely drag all of you guys and girls into our adventure, so look forward to the next few month where a dream might come true. 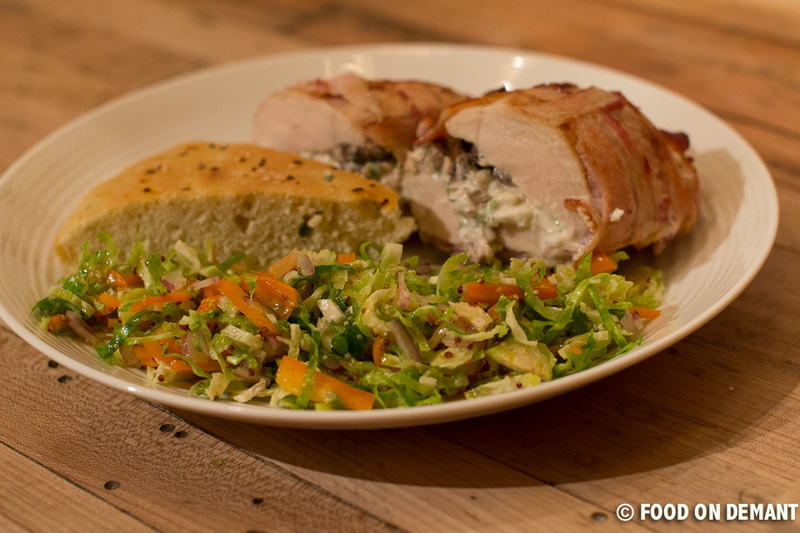 Enough about me and my entrepreneurial dream, this blog is about food and today I will show you how to make the most amazing stuffed chicken breast with a fresh and crispy brussels sprout salad. If you think that either you, your better half, children or guests don’t like brussels sprouts, don’t worry… this salad tastes nothing like the steamed brussels sprouts that everybody remember from their childhood. I would even say, that if you serve it to people not telling them what it is, they will love it and ask for the recipe. Today I serve the salad together with cheese stuffed chicken, but otherwise I like to add a little bit of feta cheese to the salad to give it an extra punch. 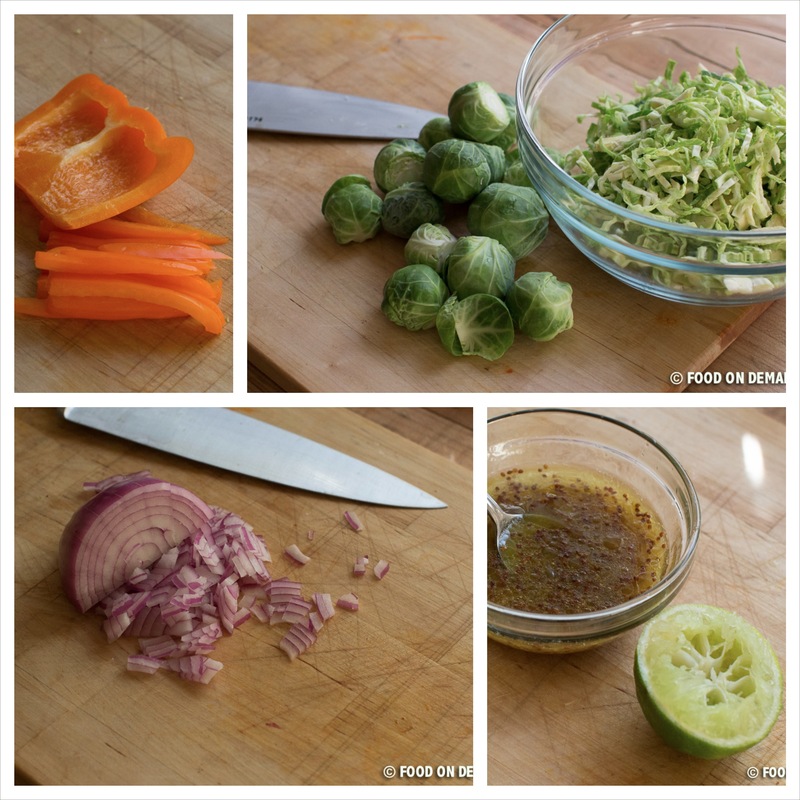 Besides this brussels sprouts recipe I can also recommend my honey glazed recipe as well as my other raw brussels sprout salad. Begin with the chicken breasts. Preheat the oven at 400F/200C and cover a baking tray baking paper followed by a wire rack. Make sure that there is space between the baking tray and the wire rack, this will help the bacon get crisp all the way around. Chop onion, garlic and chili pepper (I used jalapeños, but if you like a more kick to your chicken choose something with more heat) finely and add it to a bowl with cream cheese and black pepper. Mix it all together and set aside while preparing the mushrooms and chicken breasts. Clean and slice the mushrooms. Remember never to clean mushrooms by washing them as it will remove a lot of the flavor, use a brush or a little sharp knife instead. Add the sliced mushrooms to a dry medium-hot pan and sauté until most, but not all of liquid has evaporated. If you add too many mushrooms to the pan at one time, you will risk that instead of the liquid evaporating it will just be released into the pan and boil the mushrooms instead of sautéing them, so if you plan on making a larger portion do you self a favor and divide this process in two. Transfer the sautéed mushrooms to a chopping board and let cool before chopping them into small pieces. Season the chicken breasts with salt and pepper. Without cleaning the pan add the butter and let melt at medium heat. Add the seasoned chicken breasts and roast on all sides until light brown, about 2-3 minutes on each side. Remove the roasted chicken from the pan and make a deep slice into the side of the meat. Stuff the chicken with with your cheese filling and chopped mushrooms and wrap it in bacon. On the picture below I have used an overload of bacon, but this not necessary. The most important thing is that the stuffing stays inside the chicken and not wether you have used 4 or 8 slices of bacon and how your wrap looks like. Of cause a nice looking wrap will make a better finished impression, but if the bacon gets layered it will be difficult getting it crisp. Place the wrapped chicken breasts on the prepared baking tray/wire and bake in the oven until the internal temperature reaches 165F/74C which for me takes approximately 35-40 minutes. While the chicken is baking you have time to prepare the salad. Cut the brussels sprouts in half and slice them. Clean and slice the pepper bell and red onion too. Add all three to a mixing bowl and use your fingers or two forks to combine it. In another bowl, mix together olive oil, honey, mustard and lime juice. Mix well to make sure that the honey gets incorporated into the dressing and not left in the bottom of the bowl. Pour the well mixed dressing over the salad and mix. Leave to rest until the chicken is finished. 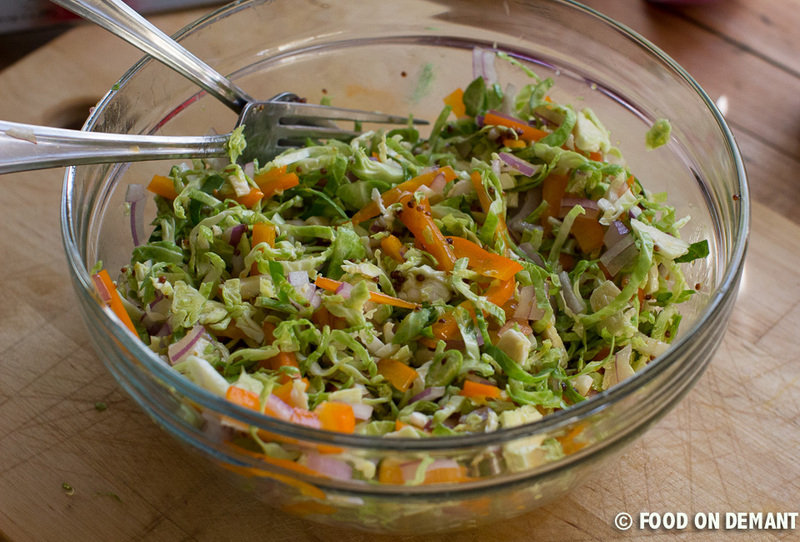 The salad can also be made in advance if you are entertaining guests or your kids while cooking. Just have in mind that if you want the salad to be fresh and crispy, you will have wait and not add the dressing until last minute. If you on the other hand would like the dressing to get well mixed into the salad you can add it early and let in rest until dinner time. I like it either way so for me it depends on the time. Remove the chicken from the oven when it has reached the wanted temperature and let it rest for a few minutes before slicing it. 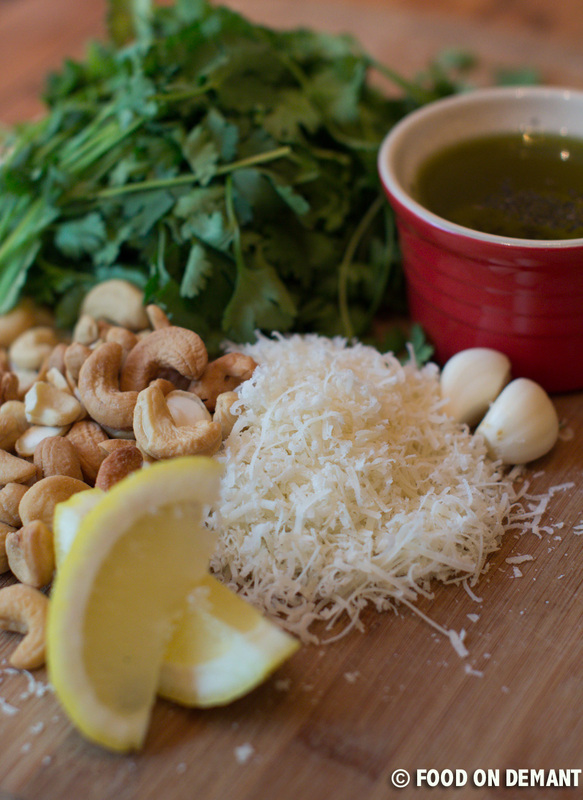 Arrange on a plate together with the salad and a piece of warm home baked foccacia bread. Serve with a light beer or a cold glass of white- or rosé wine. Once again we forgot al about time and suddenly it was dinnertime. We are not that good at eating at the same time every night, and most often we use several hours in the kitchen, experimenting and having fun cooking. Today has been nothing like that. Chris has been working late followed by an hour or two on his other hobby (designing and producing furnitures in metal and old wood), while I (Ann) has been in bed due to neck pains from an old whiplash. Begin with prepping the vegetables. Remove the seeds from the peppers and cut them lengthwise. Then cut the onions and the jalapeño into thin slices. We are both chili lovers so we rarely remove the seeds and stems from the chilies, but if you like it more mild, you can remove it (or leave out the jalapeño). Add olive olie to a frying pan and heat. Then add the peppers, onions, jalapeños and edamamme beans and sauté for 2-3 minutes. Add sugar and sir to combine. When the peppers get a glazed surface add the red wine vinegar and juice and zest from the lemon. Season with salt and pepper. Turn down the heat and let simmer for about 10 minutes or until all the fluid had thickened. While the sweet and sour peppers are simmering you can make the pork chops. Season the pork chops with salt and pepper. Heat a frying pan and add butter, garlic and thyme. When the butter begins get brown and smell like nuts, add the pork chops and fry for about 4 minutes before turning it. Fry 4 minutes on the other side too, while pouring some of butter over the top. This will give the meat a love nutty taste on the surface and prevent it from drying out in the frying process. 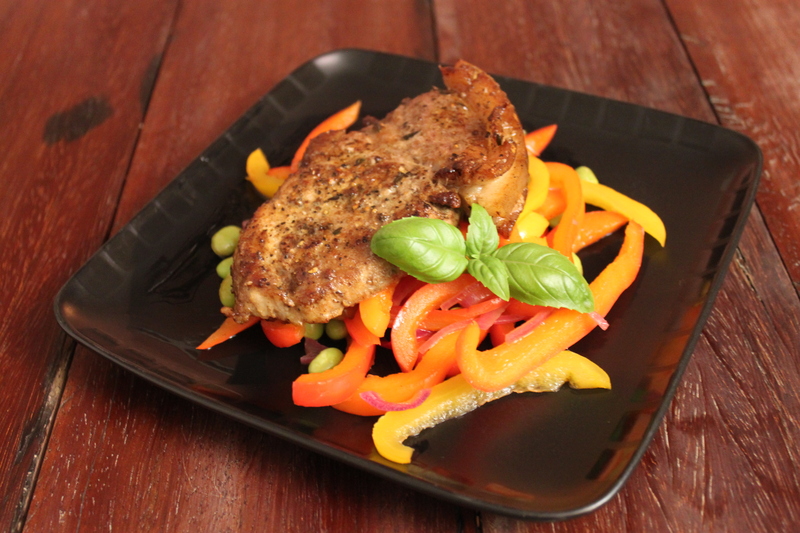 Arrange the sweet and sour pepper mix on a plate and top with a delicious and juicy pork chop and serve with bread or rice. just wanted to let you know that we are still here and we have not forgotten about you 🙂 On the contrary we have thought about the blog every day since leaving Denmark. When first arriving to Atlanta on April 1. we had no place to stay and was so lucky that we could stay with some family friends for the first week. The following we stayed at a hotel on downtown and then left for Savannah and Charleston to celebrate my 30th birthday. Being back from our trip we moved in to a nice little town house in Roswell, 20 minutes north of Atlanta. When we moved in we had nothing, and mean nothing, except our two suitcases with cloth. You might think that it is a womans biggest dream to go and shop for EVERYTHING, and so did I until it was my turn to do it… So instead of buying everything at once we ended up buying the most necessary things to begin with and then buy more as we need it. This has had a huge influence on our cooking and therefore also our blogging. However, we now seems to have enough kitchen stuff to make every day cooking easy and delicious and we will therefore strive to blog as much as possible again. Cilantro has been one of our favorite herb for years, but in Denmark it can only be bought in small amounts at well-stocked super markets and then it was pretty expensive – at least compared to the amount needed. Over here, in the US, you can get huge bundles of cilantro on every street corner and I just love it – for me it is like cilantro heaven… And even though I can buy it every were I have sown some seeds and are now waiting impatiently for it begin to grow so that I can go out on out patio and pick it fresh and put in my chicken and cheese panini or as garnish on top of a delicious curry dish. 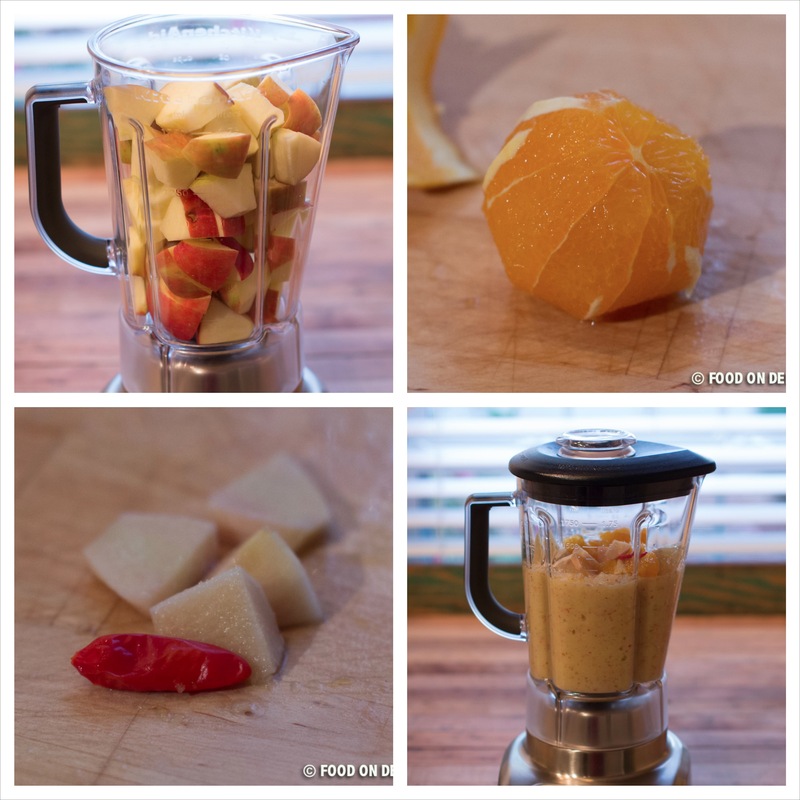 Put all the ingredients in a blender and mix at medium speed until smooth. Taste and add more lemon juice if necessary. The same goes for salt. 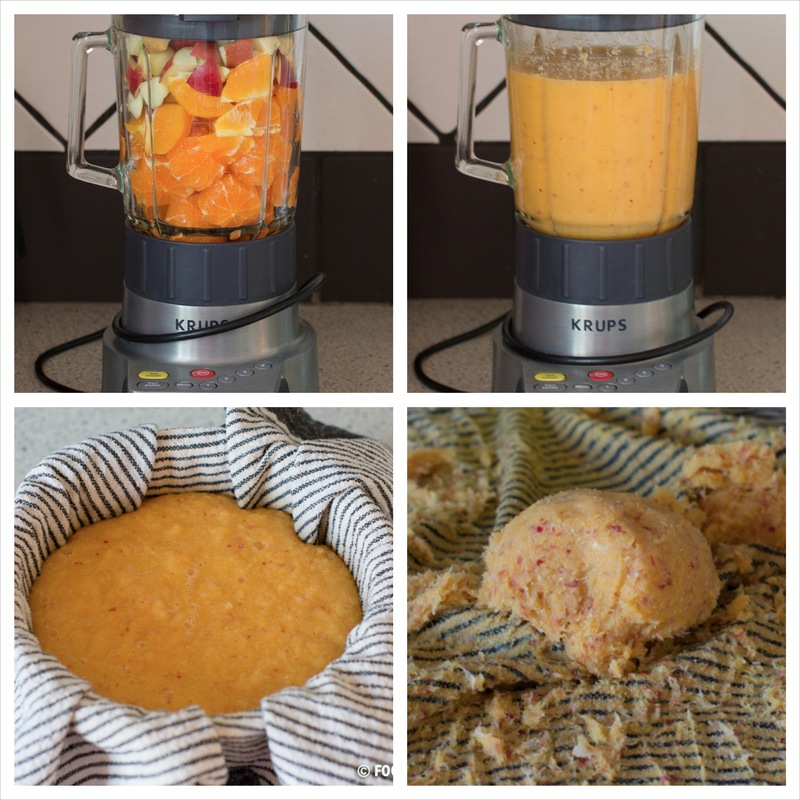 If you are the type that likes it a bit more chunky, you can stop the blender for every 5 seconds to take a look and stop when it has the wanted consistency. 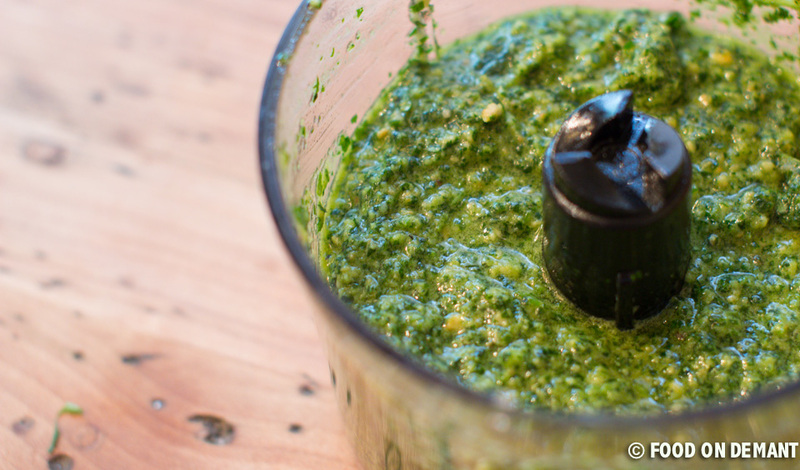 Place the finished pesto in an air tight jar and store in a dark place. When you have opened the jar the first time, you can help preserve the remains by pouring some olive oil over the pesto, just so it is covered, before closing the jar. I am overwhelmed with happiness that a year long dream became a plan, and that plan finally seems to be reality within the next 5 weeks. Relocating from one continent to another also means that we are trying to sell as many as our things as possible, so that only few things will have to be shipped. As we also sell our kitchen tools, we will run into some trouble when cooking, so for the next month or two (until we have found something to live in, and bought some kitchen tools) the blog post will be rather simple, contain restaurant review from Atlanta, New York and Austin (TX), and so on…. 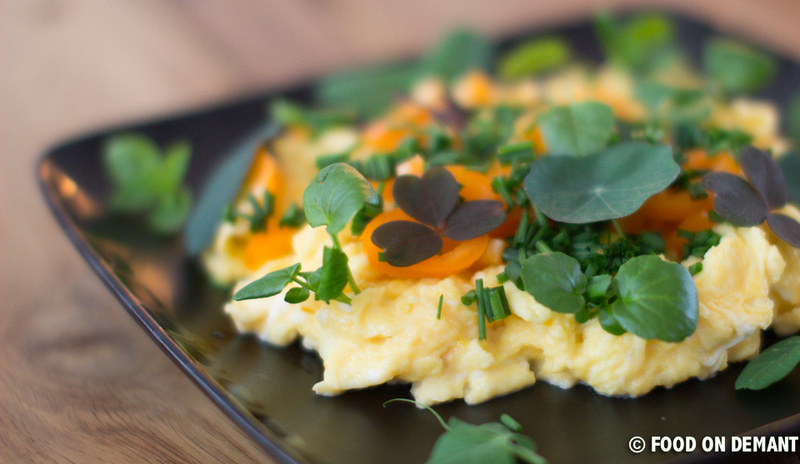 And now to the actual content of this post – my favorite breakfast Spring Breakfast Eggs. I make these eggs quite often as they are quick and easy, contain few ingredients and tastes delicious – what more can one ask for? Herbs for garnish (I’ve used chives, watercress, pee shoots, red window box wood sorrel and nasturtium but choose your favorites). Whisk the eggs together in a mixing bowl. Melt the butter at medium heat in a frying pan. Add the eggs and stir once in a while to mix. Add cream and shredded cheddar just before you think that your eggs are done, mix to combine and season with salt and pepper. Turn off the heat and stir until the cheese is melted and the cream is incorporated into the eggs. Serve for sunday brunch with your loved once or make it after a trip to the gym (if you’re like me – “I believe in Fitness” – you can bring the eggs to the gym, to eat within the first 30 minutes after finishing workout). These eggs is perfect for brunch together with these orange pancakes and a glass of sweet and colorful carrot and clementine juice. As you might have guest I have a juice period 😀 I make juice of whatever fruit or vegetable we have in the fridge and until now they have all turned out to be delicious!! One of the more untraditional juices I have made recently is my green vitamin bomb with kale, pineapple and ginger. It might sounds strange, but I promise that it tastes wonderful and has a pretty grass-green color. 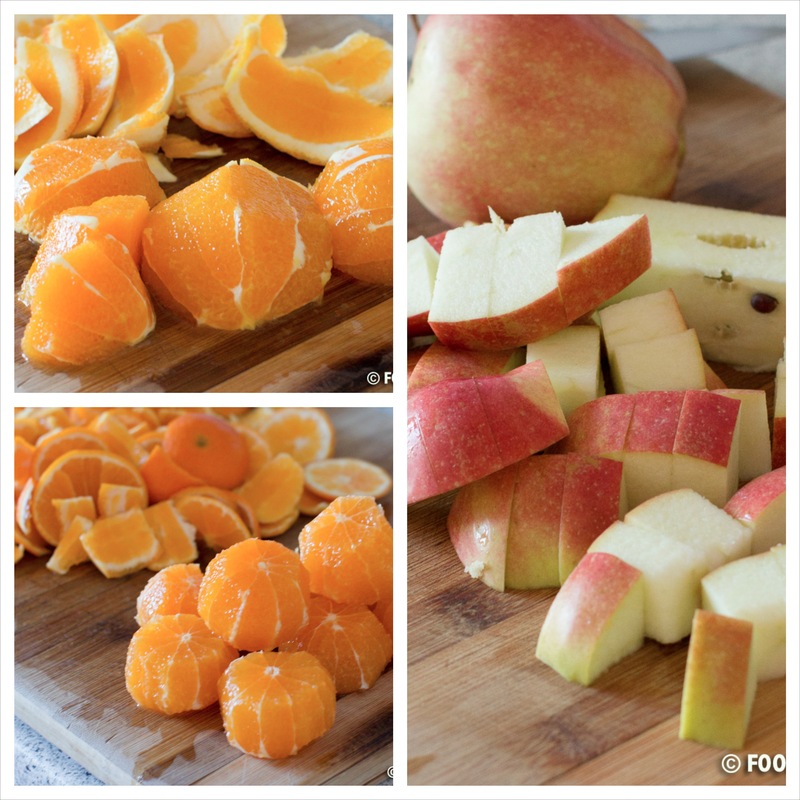 Peel the clementines and remove the core from the apple and cut it into smaller cubes. Wash the carrots and cut the top end off before slicing it into smaller pieces. I prefer to keep the skin on carrot as it contains a lot of vitamins, but make sure that you have washed all the dirt off – otherwise I’ll recommend that you peel it. 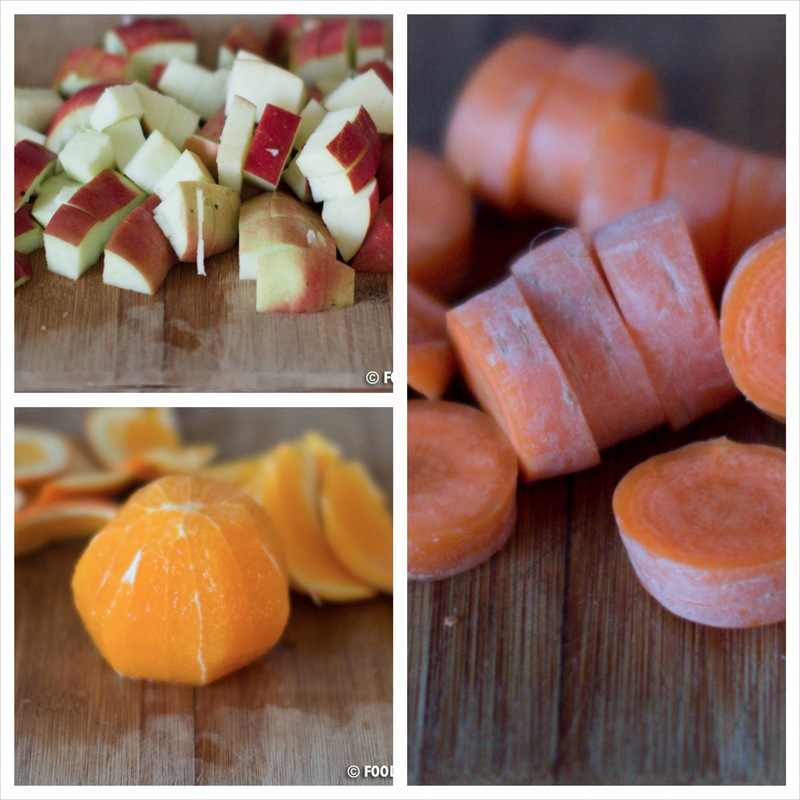 Add all the fruit and carrot pieces in a blender and blend at medium speed for 4-5 minutes. 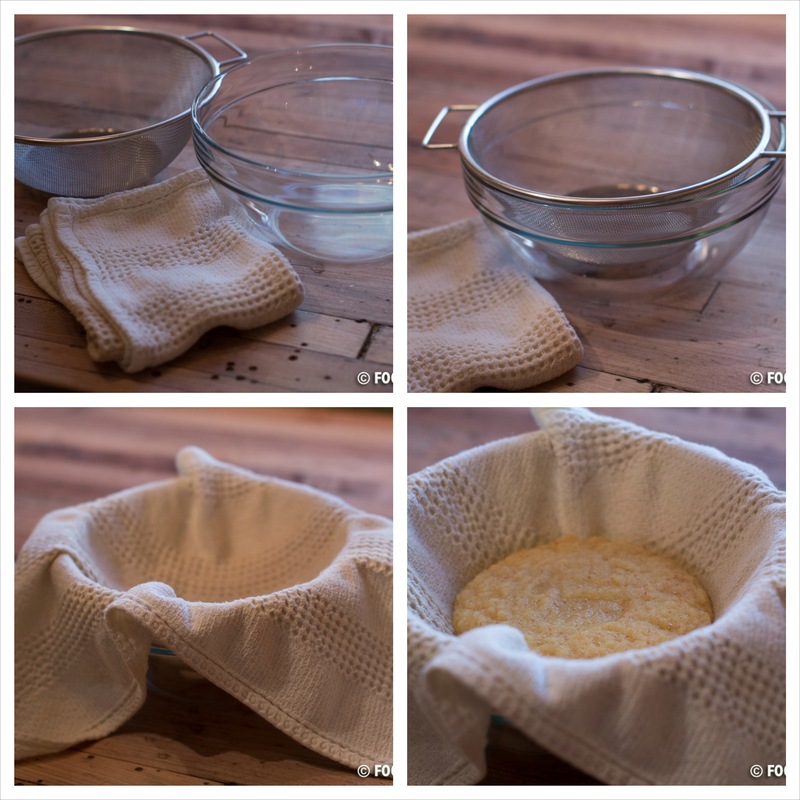 Pour the mixture into a tea towel covered bowl and gather the corners of the tea towel. 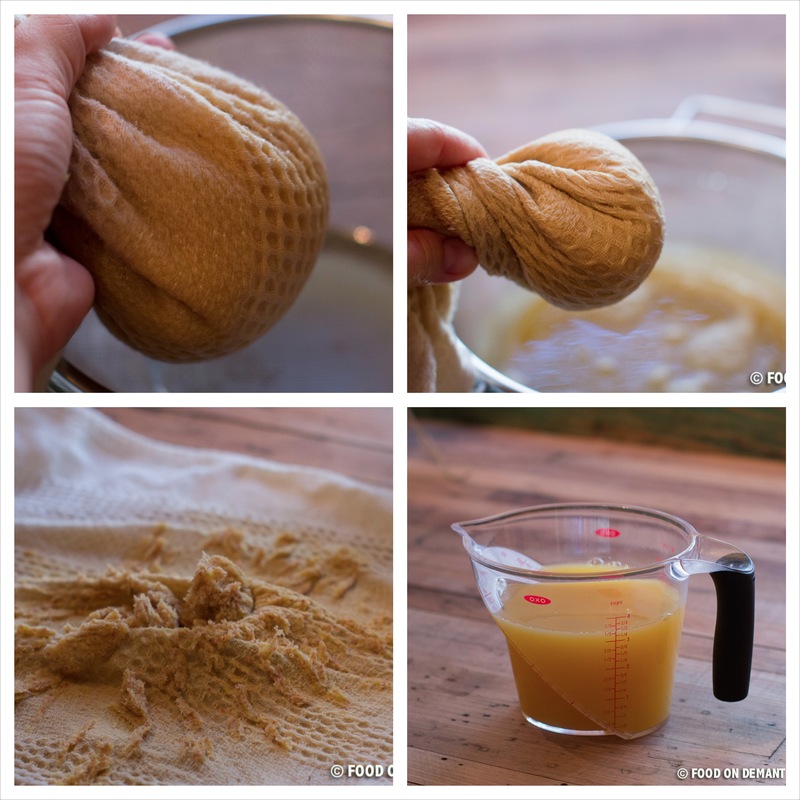 Use both hands to twist the tea towel around and squeeze all the juice out of the mixture. You will end up will approximately a little less than 1 cup of dry fruit/vegetable waste. Serve immediately with a few ice cubes or fridge for while until cold. 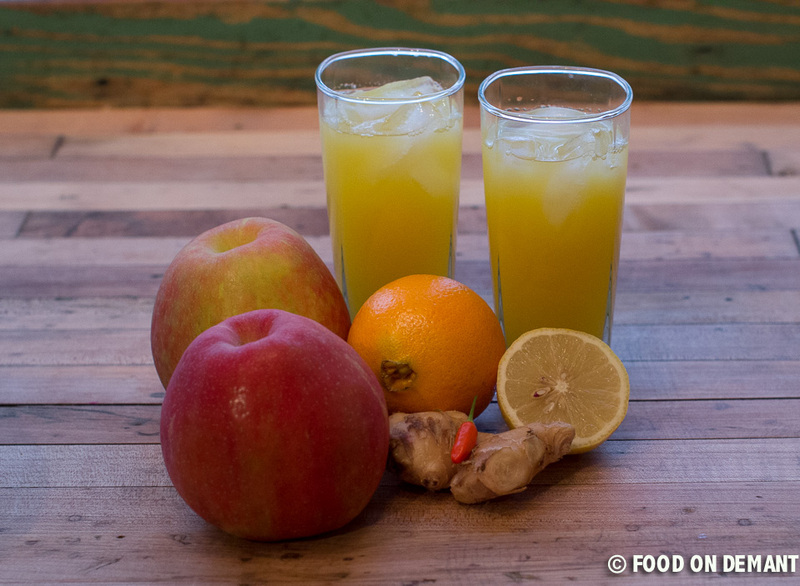 The freshly squeezed juice can stored in the fridge for up to 48 hours. I don’t know about you, but I really need to experience some sunshine very soon! The Danish winter weather has been so wired this season – it has been like a yearlong autumn with rain, storms and grey skies and it is not until recently that we have gotten a bit of snow. Actually some one told me the other day that we have only had 10 hours of sunshine in January… WTF ….!!! No wonder that I miss the sun and all it brings (including the important D-vitamines). 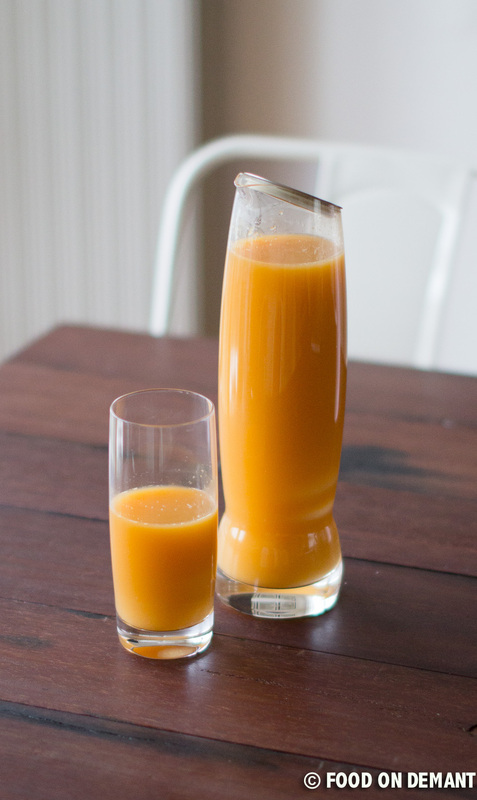 Well, if the sunshine won’t come to me and I don’t have time to vacationing right now, I will have to ‘settle’ with this PERFECT clementine and orange juice. It has a strong and still mild taste of summer and sunshine. Peel clementines and oranges. I use a knife, but if you want to get as much out of the fruits as possible you can peel it using you fingers instead. Then remove the core of the apple and chop it. Place all the fruit in a blend and blend until smooth – it takes approximately 3-4 minutes at medium speed. 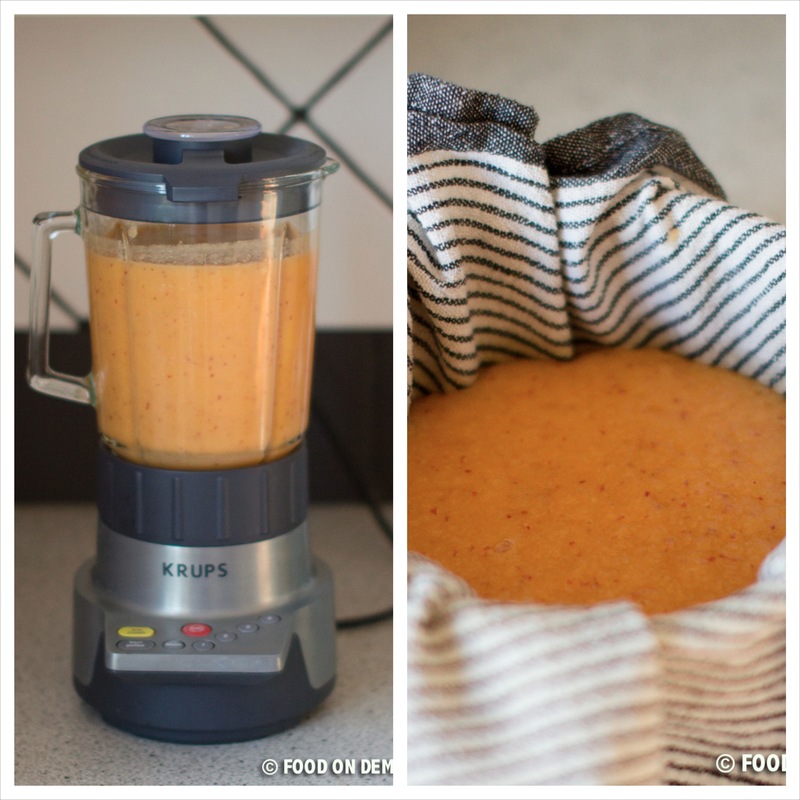 Cover a mixing bowl with a tea towel and pour the blended fruits in the bowl. Assemble the towel and squeeze with both hands until all the juice is in the bowl and all you have left is the dry fruit meat. 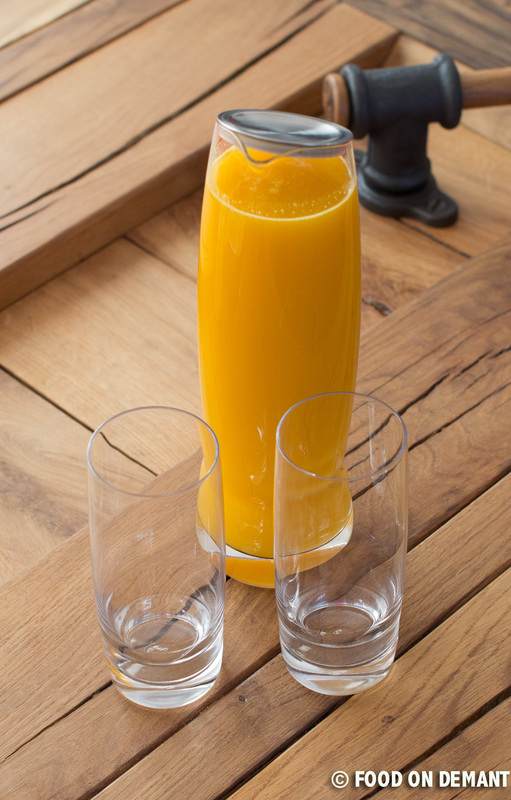 Serve the freshly squeezed juice immediately with a few ice cubes or place it in the fridge to cool down before you serve it. I make it just before serving and even though I always store my fruit in the fridge, the end product still needs cooled down so I use ice cubes.